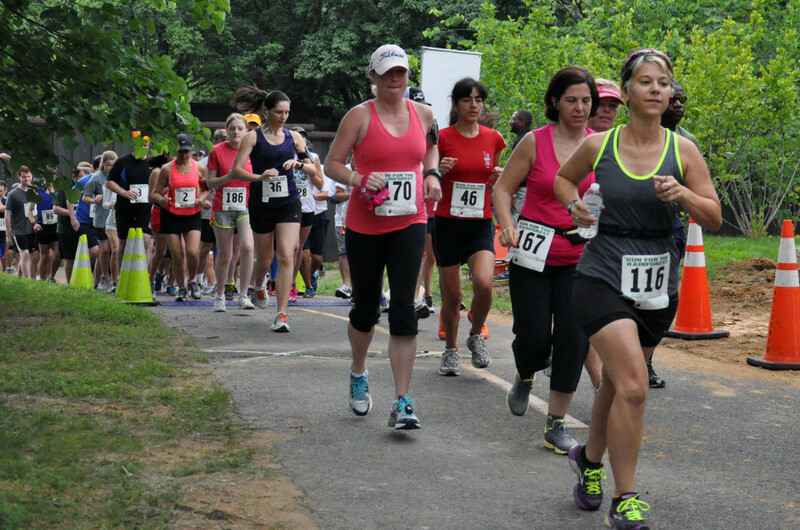 The Run for the Rainforest 5k in Arlington, Va., not only benefited the rainforest, but also felt like one as it drizzled and then poured on Sunday morning. The 3.1-mile loop course started on the Bluemont Junction Trail and continued onto the Washington and Old Dominion Trail before circling back and finishing at the Ballston campus of Marymount University. Runners lined up on the narrow running path in a light drizzle, but the sky opened up almost as soon as they’d crossed the start line. Andy Stepka, a 17-year-old who runs cross country and track year round at Paul VI Catholic High School in Fairfax City, Va., took the top spot in the race, barely edging out 15-year-old Ryan Lesmez in a very close finish. Lesmez had the lead around the final corner when Stepka picked up the pace, sprinting the last 100 meters and beating Lesmez by just a foot-length. Both men were listed as having an official finishing time of 18:25. “I was coming around the corner, and I thought we’d have to make another loop, but I saw the finish line and decided to give it my all and try to slip past [Lesmez],” Stepka said. Lesmez said he didn’t realize someone was that close behind him. “I didn’t take this race as seriously as I could and decided not the sprint the end,” Lesmez said, who runs at Yorktown High School in Arlington. In addition to the race preparing him for cross country in the fall, Stepka used the race as part of his training for the New Balance Falmouth Road Race, a 7-mile race on Cape Cod, Mass., on August 11. Lesmez is planning to do another run locally in August with friends, but has not decided which one. Dominique Lee, a 25-year-old from Alexandria, was the first woman to cross the finish line in 22:59. “It was an interesting race. I was alone for a lot of it, so that was tough, especially with all the rain and the last half was all uphill,” she said. Lee ran in college, but took a few years off after and is just now easing back into distance running. The Rhode Island native’s next race will be the Blessing of the Fleet 10 Miler in Narragansett, R. I. on July 26. She used Saturday’s 5K to gauge where she was in her preparations for the longer race, but has no plans for any other local races. She is also training for the Amica Marathon in Newport, R.I. this fall. There were cash prizes for the top three male and female finishers, and raffle prizes available to all. Finishers passed through a soggy balloon-lined fence while music blared, splashing through rivers of water on the street. Many were sporting the white technical t-shirt given to all participants, which featured the race logo: an image of a foot made up of blue and green leaves. While everyone running was soaked through head to toe, some didn’t seem to mind the wet weather. “It was so hot, I love the rain. It felt good while I was running,” said Janet Garber, a 60-year-old from Alexandria. Garber did the race with her two friends, Saleena Ross, a 59-year-old from Fort Washington, and Rita Cronley, a 59-year-old from Arlington. The three often race locally, and said they picked this race because it was the right time, place and distance for them. Cronley said she likes to switch it up, taking on both small, local races as well as larger ones with a much bigger field size. For her needs now, the Run for the Rainforest 5K seemed like a good fit. While some were just racing for fun, others picked the race because of the cause it supported. The goal of the Amazon Conservation Team is to empower indigenous people in the Amazon with the skills to better monitor and protect the rainforest. The money raised in the annual race is used to increase awareness about how important it is to save the rainforest, the race’s website said. Evan Notman, a 47-year-old from Takoma Park, Md., was drawn to the race because he’s passionate about saving the environment and had heard of the organization putting on the race. “In addition to protecting the rainforest, the Amazon Conservation Team does a lot of work helping indigenous people, which is very important,” Notman said. Isabelle Anderson, a 10-year-old who ran the race with her dad, Angus, is another nature enthusiast drawn to the race for the good cause it supports. She has participated in Girls on the Run at Rosehill Elementary School in Alexandria, but couldn’t this year because of a scheduling conflict, her father said. The two decided to find a 5K to do together as a replacement. “I love nature and I like to run, so I thought it would be fun,” she said.